Bryce Harper is one of the scariest hitters alive right now, and he has an array of weapons. The 2015 unanimous National League MVP loves to experiment with his bats, cleats, batting gloves (and no batting gloves)—in conversations with manufacturers, we often hear the term “moving target,” often changing bats from one day (or AB) to the next. 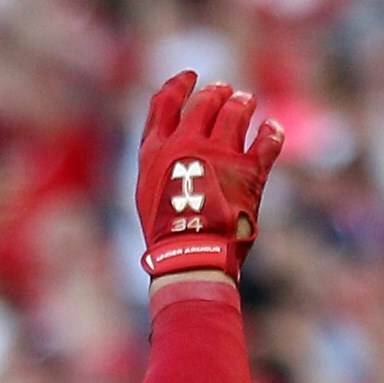 Bryce has also jumped around with glove companies, recently saddling up with Rawlings. He’s the proud owner of Under Armour’s first (and second) signature baseball cleats, the Harper One (more on that here) and Harper Two (here). Most recently, this is what we’ve seen. Let us know if you see something else and we’ll add it here.